This time an event brought me to the Schilling Cider House in the Fremont neighborhood of Seattle WA, a great excuse to drink cider on a weeknight if you ask me. It was their monthly potluck, which this month had a “sweet” theme, for both cider and food. There were still plenty of drier cider options on tap too (and with 32 tap selections and hundreds of bottles, there is something for everyone). I even found out there is one hush-hush bottled beer selection at Schilling. I started with a flight of six. However, I ended up staying there for over 4 hours, so it definitely wasn’t the only thing I drank! I picked up a nice weird dinner at PCC of some coleslaw, cheese, and pretzel bread (which is one of my favorite things to have with cider, unsalted though). Fox Tail Sweet Tooth, 5.0% ABV: This is the second cider I’ve had from this Hood River OR cidery (the first was Fuzzy Haven, tasting notes here). This was an interesting selection as they called it sweet, but it was more semi-dry? Probably more that it was sweet for their cidery. Straw yellow hue, no haziness. Rather plain and on the mild & boring side, but I don’t have any complaints. Mild tartness and acidity. Nicely balanced. Carlton Black Currant Scrumpy, 4.4% ABV: This is the first cider I’ve had from this McMinnville OR cidery, although I have a bottle of their Slake at home to try. Rich black currant scent and a lovely deep berry hue. Semi-dry. Sour! Definitely wasn’t expecting that. Unfortunately I’m not a fan of sour cider so I didn’t have more than a couple sips. Cragie’s Ballyhook Flier, 5.8% ABV: This is an Irish cider which I’ve seen in bottles and have wanted to try, so here was my chance. Hazy yellow-orange hue. Dry cider apple and yeast scent. Dry. Moderate bitterness. Mild sourness, funkiness, tartness, and astringency. Moderate tannins. Complex and unique. However, it was too bitter for my liking. I think some additional sweetness to balance it would have been nice. I’ve had some ciders made from higher tannin cider apples which weren’t bitter, but it appears to be difficult to pull off. Bull Run Strawberry Fields, 6.5% ABV: This is the first cider I’ve had from this Forest Grove OR cidery, although I’ve been meaning to try their ciders for awhile (way too much good stuff available around here). Light cherry color. Lovely real sweet strawberry scent. On the drier side of semi-sweet. Moderate strawberry flavor. I imagine it was difficult to develop this cider, to get a true strawberry flavor without seeming fake or being too sweet. I have found very few fruity ciders that were full flavored without being very sweet or overpowering the apple (Snowdrift Red and Eaglemount Quince are two I love, but they are on the more spendy side). I’m a fan! Finnriver Pear, 6.5% ABV: I’ve had a number of Finnriver selections, but hadn’t had this one before (Chimacum WA). This is a cider (apple juice) with pear juice added (ie. its not perry, which are made only using pear juice). Straw yellow, no haze. Light clean pear scent. On the drier side of semi-sweet. Plain, but it had a nice real pear flavor. Quite good, but not my favorite from them (I’d recommend Lavender Black Currant, Honey Meadow, and Fire Barrel). Elemental Atomic Root Beer, 6.5% ABV: I’ve tried a couple of their ciders, but I was curious about this new one (Woodinville WA). Its a hard root beer, but in contrast to other products (such as Not Your Father’s Root Beer), it is cider instead of malt based! Nice caramely root beer hue. Smells of root beer with a hint of baked apple. Tastes like a nice mild root beer with a hint of baked apple at the core. Only semi-sweet, which I appreciated. It could have used some additional carbonation, but I say that about most ciders. Tasty! I can see why this one has been a huge hit for them. I then realized I had finished my first flight and the actual event hadn’t started yet, as I got there so early (due to my work schedule). So, I ordered a half flight. Without realizing it I got three berry ciders (they were about the only ones left on the board I hadn’t tried, besides ginger & hops & such that I don’t care for). Atlas Pom-Cherry, 5.8% ABV: I’ve had the Apple and Blackberry selections (reviews here and here) from this Bend OR cidery. I also have their Apricot variety at home to try. Tart cherry scent. Semi-sweet to sweet. Lots of pomegranate flavor. Only mild tartness and the slightest hint of sour. Thin bodied. Bold flavored. It was my favorite of these three, but I still think I like their plain apple best of the three varieties I’ve tried from them so far, and overall its not a favorite of mine or anything. Cider Riot Never Give An Inch Oregon Blackberry, 6.9% ABV: This is the first cider I’ve had from this Portland OR cidery, although I have a bottle of their 1763 at home to try. Dry. Very tart. Only mild berry flavor. I found it kinda unremarkable, and my least favorite of these three. It was too tart for my liking and I don’t think I finished it. Tart fans who like berry ciders but find them all too sweet may want to give this one a try though. Elemental Oxygen (Pomegranate), 6.5% ABV: I’ve had a number of ciders from this Woodinville WA cidery. Poured very foamy. On the drier side of semi-sweet. Tart. Thin bodied. Rather mild flavor, which appears typical for them. Their Atomic Root Beer is definitely my favorite from them so far. During this time the actual potluck started (5pm), and it got busy (for awhile I was the only customer!). I got to see Mick from Click Distributing again, meet two guys from D’s Wicked Cider (Kennewick WA), meet Sarah’s mom, and see Merce from Cider Log again. Plus I nimbled on some tasty treats. I sampled D’s Wicked Baked Apple, their new 6.9% instead of 8.5% ABV variety. Apparently most folks won’t be able to taste the difference. One of the reasons they did this was because there is an apparent WA state rule against doing growler fills above 7% ABV. This is the first cider I’ve tried from them. I had avoided buying a bottle of this one as I assumed it would be too spiced for my liking (not a spiced cider fan, or any spices in general…not even pepper on food). However, the cinnamon was quite mild (at least when the keg wasn’t fully cold yet), and it had more baked apple flavor. Quite tasty actually. They said the cinnamon showed up more when it was fully cold though. Nice and frothy and on the unfiltered side. Semi-sweet. Medium to heavy bodied. Its not something I’d buy, but I was pleasantly surprised, and definitely see why they are so popular. Also, Sarah remembered about a bottle of Eric Bordelet Poire Authentique in the cool room (I think this was a sample or something, as its not one of the Bordelet varieties they carry). It was definitely flat after being open about a week (apparently its typically quite sparkling), but we all found it tasty (there was enough for a couple sips each). At only 3.5% ABV, this French perry is easy drinking at its finest. I have only heard rave reviews about Bordelet and they’ve been on my want to try list. Bold flavor, but clean, unlike some perries. On the drier side of semi-sweet. Rich flavor and very balanced. I really enjoyed this one, but I’m not sure I could bring myself to pay $15-20 for a 750ml bottle of a sub 4% ABV cider. This reminded me of the bottle pour of another Poire I had here, Domaine Pacory Poire Domfront (tasting notes here). They also had a Randall going that night where they infused Schilling Gold cider with oranges, coconut, and Chai tea. An interesting combination, as always! It was pretty tasty, although I would have preferred no tea and lots more coconut. The tea seemed to make the cider seem drier than I remembered Gold tasting (which is one of Schilling’s sweeter varieties, and their only plain cider I believe). Sarah said this was her favorite Randall so far. Mick also decided to pick up a bottle of Millstone Farmgate Dry and share it with us. I had this one at Cider Summit Seattle 2015 (tasting notes here), in an attempt to see if there was any variety from Millstone I’d enjoy (as I definitely didn’t like their Cobbler). This variety is definitely sour & funky, but less harsh than Cobbler by a few times probably. I’m always surprised to see Cobbler make cider lists without any notes of its sour flavor, but apparently a lot of folks like that sort of thing (like sour beer I guess). Its a good thing they make so many ciders, so there is something for everyone. That is a lot of cider!~ I love your flight photo. Mmm… pretzel bread with cider. That sounds good. Thanks! Their flights are six 3oz pours, so its not too bad (just over a pint). Often I don’t finish a cider I don’t like either. 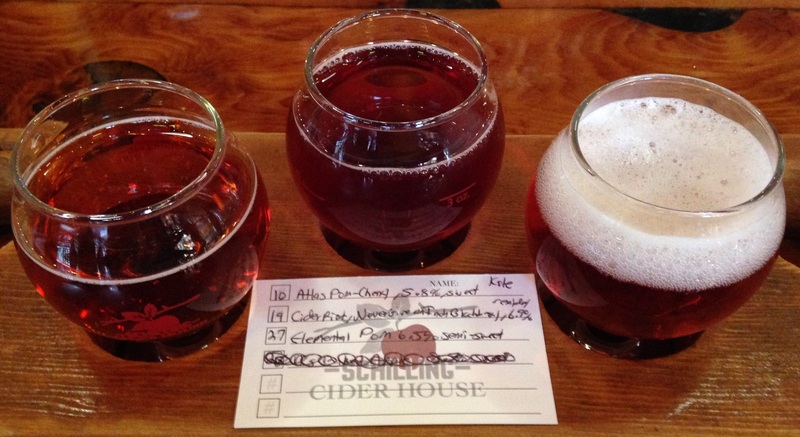 Its great to be able to try so many ciders in one go…their 32 tap selection is pretty epic. Pretzel bread goes awesome with cider…its good to have something starchy when trying a lot too.